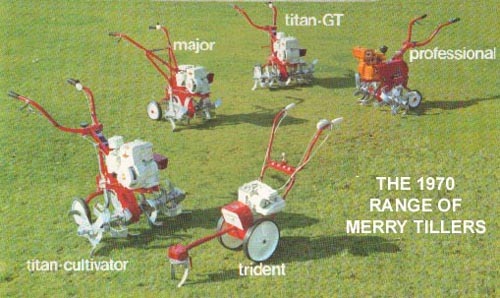 The first Merry Tillers in the UK were produced by the Wolseley Sheep Shearing Machine Company in Birmingham in the late 1950's. 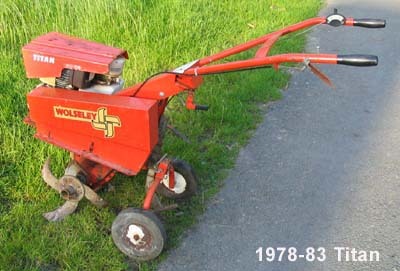 Very early Wolseley cultivators had a Suffolk engine. This proved to be too small for the job and a Briggs & Stratton engine, (as on US machines), was substituted. 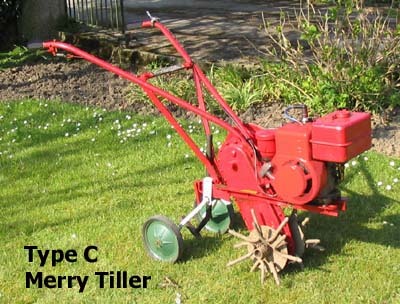 The British Lawnmower Museum in Southport contains an example of the type C Merry Tiller Major fitted with a Webb cylinder lawnmower attachment. 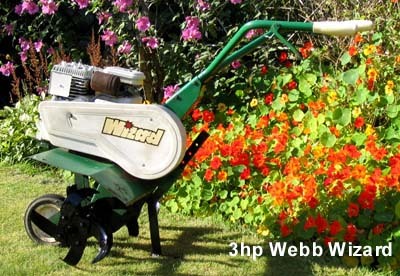 (Webb were part of the Wolseley group of companies). In 1958 Wolseley changed their name to Wolseley Engineering Ltd. The Type C sold in reasonable quantities and many are still in use. Its Achilles Heel is the "Transport wheel assembly" which is inclined to collapse when worn. This does not affect the machines performance in the soil but getting it to the vegetable patch is a problem! Engines were 2.5 or 3 HP Briggs & Stratton. Chassis on early models was folded "angle iron", this was a bit flimsy and rolled steel angle was substituted during the Type C's production run. Finger Tines were fitted as standard with "Slasher" and other tines available as extras. Coupling tubes were used to join on extra tines in order to cover more ground in one pass. The Professional rotovator was also available which was similar to the later type D Major except for the use of a 2.5 hp Clinton engine. The Type D came out around 1961 and had a cast steel "hitch" (earlier Majors used a fabricated hitch) and a rectangular section "Skid" replaced the round bar type used on the earlier model. Larger (10") transport wheels were used (made by the Hughes company, another member of the Wolseley group) and the transport wheel frame was much stronger and quickly detachable. Serial numbers for these machines start at MT.20,000 for the Major and MTP.5,000 for the Professional which was fitted with a larger (Clinton) engine. 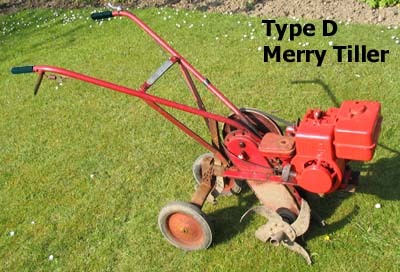 This Merry Tiller is almost identical to its' contemporary US Professional model. Handles that swivel to the side were listed as an option. The coupling tubes were now welded to the extension tines. At some time in the mid 1960s a belt guard was fitted. The choice of tynes became optional and most customers chose "slasher" tines instead of "finger" tines. "Type D" was no longer stamped on the nameplate. In about 1966 new, stronger handles were fitted, now attached to the chaincase by a single bolt, through welded on brackets. Serial numbers had restarted with an M prefix for Majors, P for Professionals and a T prefix for Titans. The Titan looked similar to the Major but shared few components, having a different, all roller bearing chaincase with three sets of chains, a stronger hitch casting, different chassis, larger 5HP engine and two sets of belt pulleys for changing speeds. The Professional continued with a new, stronger hitch casting and the same handles as the swiveling type fitted to Titans and optional on Majors. In about 1968 the engine on the Major changed to the Briggs & Stratton type 80200. Still a 3HP unit it had a pulsa-jet carburetor that fitted on top of the fuel tank, which was now behind the engine. The extension tines had swaged tubing instead of coupling tubes to join them together. These machines sold in large numbers and by 1974 the Merry Tiller was "Britain's Top Seller". The use of plastic transport wheels and, in about 1976, a 4hp engine for the Major seem to be the only changes in a decade. Other models had joined the lineup, the Titan GT with its all geared transmission, the Trident and the weird and wonderful Twin Six which was two Merry Tillers tied together. 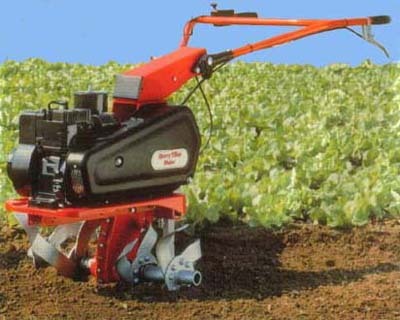 The 5hp "Super Major" replaced the Professional about 1976. The Wizard and identical Cadet with a single transport wheel and lightweight tines, were also introduced at this time. Two different Wizards were made, a 5hp version with a heavy angle iron chassis and a 3hp version with a lightweight angle chassis. A radical re-design was carried out in 1978. New handles, chaincase, belt guard, a folded steel chassis and smaller transport wheels altered the look. The Titan now had a reverse gear in the chaincase. The GT got the new chassis and a 7hp engine. Sheet metal "cowls" on top of the engines came in. Other minor modifications meant that few components from earlier models were carried over. The Trident and Twin Six had been dropped. The makers name changed to Webb for a short time. The final models differ from the 1978 lineup in a number of ways. In 1983 a new lightweight pressed steel "chassis" was fitted over an angle iron one, hitch castings and handles changed again, and a plastic belt guard was used. The Wizard name had been dropped, the 3hp Cadet gained folding handles and a new model the Spartan, basically a Major with a 5HP engine had been added to the range. The Super Major had a reverse drive belt as standard. (Earlier Majors had reverse as an accessory). The 5HP models had an extended hitch. The 7hp Titan GT was discontinued. An all new 5hp Titan GT with independently clutched rotor shafts to give skid steer, was advertised in 1983 brochures but not listed in price lists and probably never reached the public, so the Titan toped the Merry Tiller range. In about 1984 Atco took over production when Wolseley decided to concentrate its activities on plumbing and domestic boilers. Wolseley Plc are now the largest plumbing sundries supplier in Europe. The engine cowl, by now a complex pressing, did not survive the Atco takeover. Atco had joined the Qualcast group and some modified Cadets were sold as Qualcast B66 rotivators using an updated version of the Suffolk engine that was used on the first UK Merry Tillers. The end of British production came around 1990. The last of the line, the Atco Merry Tiller Major.